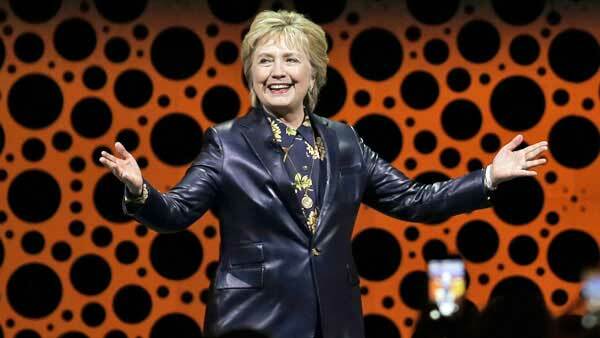 SAN FRANCISCO -- A spirited Hillary Clinton took on the Trump administration Tuesday in one of her first public speeches since she lost the presidential election, criticizing the country's Republican leaders on everything from health care to the shortage of women appointees in top administration positions. Cracking jokes about her November defeat and her months out of the limelight since, Clinton spoke to thousands of businesswomen in San Francisco, joking there was no place she'd rather be, "other than the White House." Without mentioning President Donald Trump by name, Clinton faulted the Republican presidential administration repeatedly, including calling its representation of women in top jobs "the lowest in a generation." She declared herself appalled at a much-circulated photo showing an all-male group of Republican lawmakers last month negotiating women's coverage in health care legislation, noting a social-media parody of it that showed an all-dog panel deciding on feline care. Last week's failure of the GOP health care bill, Clinton told a cheering, applauding crowd, was "a victory for all Americans." Clinton has kept a low profile after Trump defeated her for the presidency, except chiefly for sightings while she took walks outdoors with her husband, former President Bill Clinton. She said earlier this month that she intended to start speaking out again on public issues. On Tuesday, she urged voters to resist Trump policies that she said included suspicion of refugees and suppression of the vote in some areas. "It's the kinds of things you think about when you take long walks in the woods," she said. "Resist, insist, persist, enlist."